First described by Sir Robert Graves in the early 19th century, Graves' disease is one of the most common of all thyroid problems. Once the disorder has been correctly diagnosed, it is quite easy to treat. In some cases, Graves' disease goes into remission or disappears completely after several months or years. Left untreated, however, it can lead to serious complications -- even death. Although the symptoms can cause discomfort, Graves' disease generally has no long-term adverse health consequences if the patient receives prompt and proper medical care. Hormones secreted by the thyroid gland control metabolism, or the speed at which the body converts food into energy. Metabolism is directly linked to the amount of hormones that circulate in the bloodstream. If, for some reason, the thyroid gland secretes an overabundance of these hormones, the body's metabolism goes into high gear, producing the pounding heart, sweating, trembling, and weight loss typically experienced by hyperthyroid people. Normally, the thyroid gets its production orders through another chemical called thyroid-stimulating hormone (TSH), released by the pituitary gland in the brain. But in Graves' disease, a malfunction in the body's immune system releases abnormal antibodies that mimic TSH. Spurred by these false signals to produce, the thyroid's hormone factories work overtime and exceed their normal quota. Exactly why the immune system begins to produce these aberrant antibodies is unclear. Heredity and other characteristics seem to play a role in determining susceptibility. Studies show, for example, that if one identical twin contracts Graves' disease, there is a 20% likelihood that the other twin will get it, too. Also, women are more likely than men to develop the disease. And smokers who develop Graves' disease are more prone to eye problems than nonsmokers with the disease. No single gene causes Graves’ disease. It is thought to be triggered by both genetics and environmental factors. Eye trouble -- usually in the form of inflamed and swollen eye muscles and tissues that can cause the eyeballs to protrude from their sockets -- is a distinguishing complication of Graves' disease. However, only a small percentage of all Graves' patients will experience this condition, known as exophthalmos. Even among those who do, the severity of their bout with Graves' has no bearing on the seriousness of the eye problem or how far the eyeballs protrude. In fact, it isn't clear whether such eye complications stem from Graves' disease itself or from a totally separate, yet closely linked, disorder. If you have developed exophthalmos, your eyes may ache and feel dry and irritated. Protruding eyeballs are prone to excessive tearing and redness, partly because the eyelids can no longer shelter them effectively from injury. In severe cases of exophthalmos, which are rare, swollen eye muscles can put tremendous pressure on the optic nerve, possibly leading to partial blindness. Eye muscles weakened by long periods of inflammation can lose their ability to control movement, resulting in double vision. Rarely, people develop a skin condition known as pretibial myxedema. It is a lumpy reddish thickening of the skin on the shins. It is usually painless and is not serious. Like exophthalmos this condition does not necessarily begin with the onset of Graves' nor does it correlate with the severity of the disease. National Endocrine and Metabolic Diseases Information Service: "Graves' Disease." University of Miami Health System: "Hyperthyroidism." 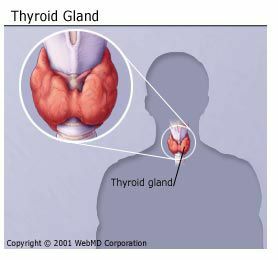 The American Thyroid Association: "Graves' Disease."